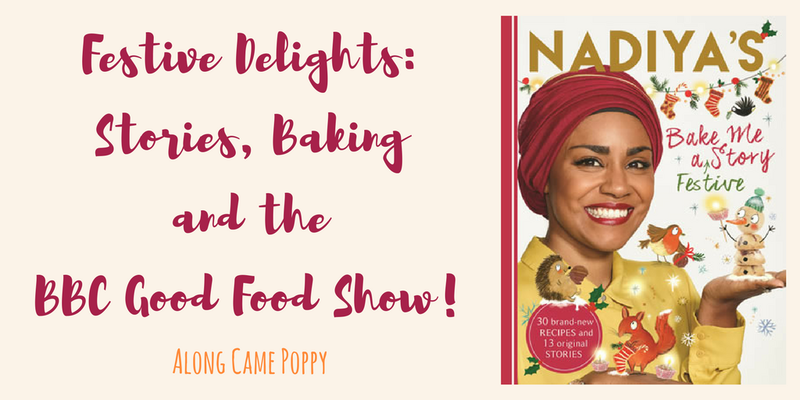 Along Came Poppy: Festive Delights: Stories, Baking and the BBC Good Food Show! Festive Delights: Stories, Baking and the BBC Good Food Show! From a really young age Mini Reviewer, Izzie, has loved cookery programmes her favourites including anything with Mary Berry or the Hairy Bikers and, of course, The Great British Bake Off. In fact when Izzie discovered Mary was not going to judge the latest series of GBBO she actually sobbed uncontrollably for about half an hour, however once the first episode got going she quickly recovered and happily sat through every episode after that - sorry Mary, six year olds are rather fickle! Now as a GBBO fan Izzie is very familiar with Nadiya Hussain, winner of the sixth series. So when I came across her latest book, Nadiya's Bake Me A Festive Story, which combines 13 wintery stories with a selection of simple recipes, I knew that it would be perfect for our countdown to Christmas. Packed full of brilliant photos and quirky illustrations from Clair Rossiter, this book just oozes festive cheer and you cannot help but smile as you turn the pages. It would definitely make a great gift for any little bakers this Christmas and over the next few weeks we are going to give some of the recipes a go starting with Cheesy Feet Biscuits! However I am not promising to share the results just in case things don't go to plan, which is so often the case when I enter the kitchen! This book arrived just at the right time as this week we are off to the BBC Good Food Show at Birmingham's NEC where, fingers crossed, we will bump into Nadiya so Izzie can get a quick autograph. We haven't visited the show as a family before so it will be interesting to see how our experience differs to previous years. In the past we have always found it to be a great opportunity to sample new products, get some amazing Christmas presents from independent retailers and see an array of celebrity chefs in action. This year the fantastic line up includes Nadiya, Mary Berry, the Hairy Bikers, Michael Roux, James Martin and many, many more. We will let you know how we get on! The BBC Good Food Show starts on Thursday 30 November and ends on Sunday 3 December 2017. You can find out more information including a full list of exhibitors and ticket prices here. Have fun at the Good Food Show! I enjoy festive baking so much, I’m actually planning what to could do this year with my daughter as we have so much fun together. Thanks so much for linking up at #KCACOLS. Hope you come back again next time. I love GBBO so anything related to that is good in my book!